Tim wrangles mechanized prehistoric monstrosities in the latest AAA blockbuster for the PlayStation 4. 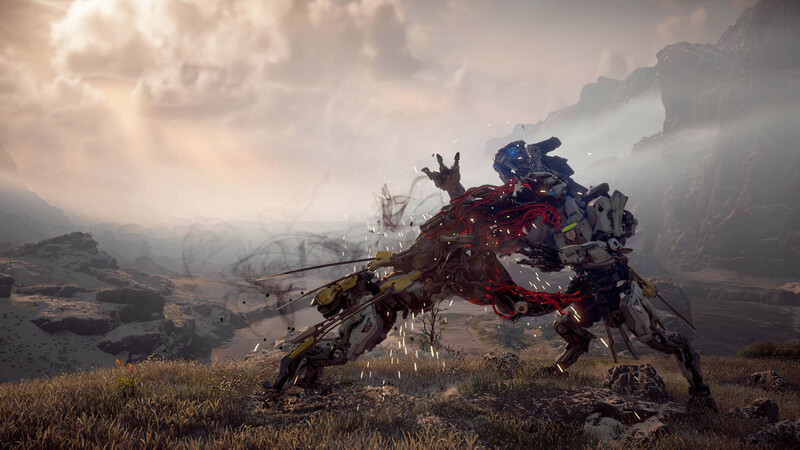 Horizon Zero Dawn is developer Guerrilla Games' first swing at an open world game, perhaps having decided it'd had enough of the Killzone franchise (god knows I had). Both Killzone and Zero Dawn are set in a far-flung future, but the latter's setting is a far cry from the former's drab and lifeless post-apocalypse, setting aside grey gloom in favour of a vibrant paradise ruled by enigmatic mechanized creatures that roam its far reaches. Here, humanity only exists in primitive tribes, with knowledge of the cataclysm lost to superstition and the passage of time. Players will follow the exploits of young woman Aloy, as she seeks answers about not only humanity’s past, but her own. How and why this world has come to be is the driving force behind the story, and as you progress through the main quest arc, your knowledge of both the current and the ancient world blossoms. The mystery is intoxicating, for as Aloy slowly discovers more about the realm and her place in it, there is the constant reminder that she understands as little of the machines as you do. Zero Dawn's pacing is definitely sluggish at first, as once past the introduction everything stalls while the player traipses across the first area completing insignificant tasks that don’t seem to have much point. The truth is that the first few hours are a bit of a slog, but the game does eventually shift gears and get going as more areas and abilities are unlocked. The last half of the main story kicks things into overdrive, delivering an exhilarating narrative that really packs an emotional punch. It should be noted that while this game certainly has role playing elements, it’s very much an action-orientated adventure, with player choice during dialogue having minimal impact on the outcomes of any of the quests. And while the main questline is a high quality production, most secondary quests are not of the same calibre, with the story sometimes little more than window dressing. It feels like Guerrilla made an adventure game and added some of the game's RPG mechanics to the world as an afterthought. And what an incredible world it is. Skeletons of skyscrapers now green with moss loom over a land that has long since recovered from the apocalypse that tore it asunder. In many places, there is almost nothing left to show that our existing civilisation was ever there, with mother nature’s carpet steadily swallowing up what remains. It is without a doubt the most beautiful open world game I’ve played to date, and easily one of the best-looking games on the PlayStation 4. Time and again I would stop to take in the view ahead of me, or listen to the sound of the wind in the trees above. For all it’s beauty, it is also equally dangerous, as the mechanical creatures that populate the land are now the true apex predators of the food chain. The more skittish herbivore archetypes will run when they see you, but everything else will come after Aloy with a vengeance. Choosing to stand and fight isn’t always an option either, and many a time you’ll be required to beat a hasty retreat as Aloy’s starting weapons are often no match for the superior strength and weaponry of the more aggressive animals. When you do decide to engage a group of machines in combat, forethought and planning are a must. Even the smallest enemies are deadly as they gang up and overwhelm you, so using traps and stealth kills to whittle down their numbers tips the scales in your favour. Larger machines are not so easy, requiring a well-stocked inventory of weapons and healing potions if you decide to tussle with them. Even at the standard difficulty the game can be brutally unforgiving, so sometimes sneaking past enemies with a few well-timed distractions is the safer bet. To help her survive in this hostile environment, Aloy must make the best use of her gear and any upgrades she finds for it. All the weapons available are of a primitive nature with a technological twist, such as a bow that fires arrows with explosive tips, or a slingshot that lobs electrical shock balls. Weapons and clothing can be upgraded to varying degrees, either by stripping the parts from vanquished machines or by purchasing them from merchants. In the quiet moments when you're not getting chased over hill and dale by angry Sawtooths, or fleeing for your life from a massive Thunderjaw, there are plenty of collectibles to go searching for. Hunting through ruins will often net you trinkets to sell to merchants, and there are also strange metal flowers containing poems written in computer language. The game's map is fairly large, so tracking down all these hidden items will obviously take some time. My only real nitpick in what is otherwise such a well-crafted game is that the voice acting from many of the supporting cast seems stilted and forced. While Aloy and the other main characters come across as more natural, some cut scenes were really let down by this issue. Not every game is going to feature the same production quality in this area as, say, a Naughty Dog title, but a little more work here would not have gone amiss. Horizon: Zero Dawn is an incredibly ambitious title that meets or exceeds expectations at almost every turn, and is a joy to play. Gorgeous visuals and solid gameplay are woven into a story that deals with some surprisingly hard hitting themes, all wrapped up in a package that is highly polished. In short, it's a worthy addition to any PlayStation owner’s game collection. Guerrilla Games' punt on a new IP has paid off handsomely, as despite its silly title, Horizon Zero Dawn is a magnificent open world action-adventure that lives up to its hype. Ups A visual feast. Challenging yet highly enjoyable combat. A wonderful story. Downs Slow start. Some jarring voice acting. Tie me robo-roo down, sport.